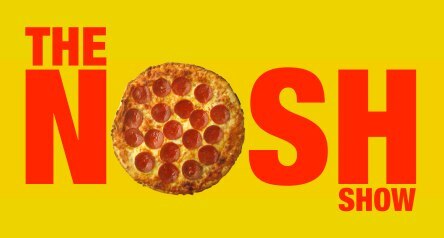 Episode 8 of The Nosh Show is now available! Head on over to The Nosh Show website to listen and this one as special as it's the first one to feature a special guest. We still do follow up, nosh or not, and our nosh of the week (mine here). Let us know what you think! Now I try to always grab a few special noshes between shows, but this weeks is a little tame. 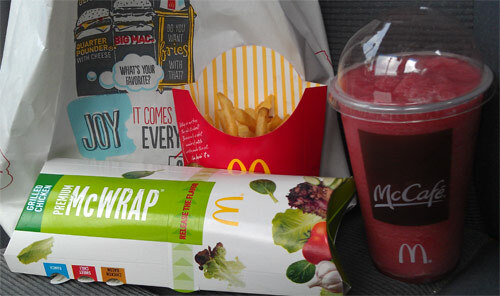 I headed over to McDonald's to try the new fusion tea but wound up getting grilled chicken and ranch McWrap with a Cherry Berry Chiller (and a poorly filled fry container). The chiller is an okay drink, but nothing special. It kind of felt watered down and at no point did I really detect any cherry flavoring. Also, for some reason I kept thinking my ranch McWrap tasted like a salty hot dog with lettuce on it, maybe it was trying to make up for the unsalted fries. Sure, overall it could have been much worse, but I probably would have been better off trying a steak quesadilla like GrubGrade... or at least waited to hit McDonald's after monopoly starts back up tomorrow. 2014 Update: I've actually had several of the bacon grilled chicken McWraps because I really like them, preferably without the cucumber slices though. It just feels like a fresh lunch as opposed to the another greaser burger with substandard fries from one of the other burger joints.